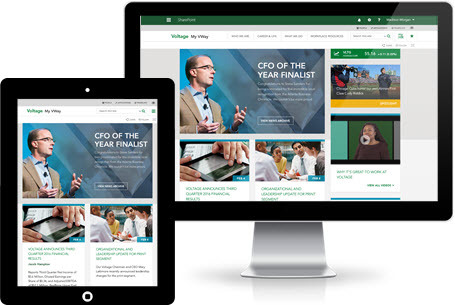 Give your employees the modern digital workplace experience that they deserve. Is Rise Right for Your Organization? Rise delivers an integrated Office 365 intranet experience for our customers giving all employees the intranet they deserve. Rise enables you to effectively communicate with every employee through curated content, global alerts, and two-way communication. Content authors are enabled through easy-to-use templates so that they can focus on creating beautiful content without the need for technical assistance. Users are able to access content that is relevant and timely regardless of the device they are on. The modern intranet is a conversation and a way of connecting. Rise facilitates the conversation by providing integrated social capabilities such as feeds, comments, and sharing. Your users can engage with content and with each other. Rise was designed with a mobile-first philosophy that shines through. Rise’s consumer-style user interface is optimized for desktop, tablet, and mobile viewing. So whether you are in the office or on the go your content is accessible and user friendly. Your brand is not just the external face of your company, it is something that your employees recognize and identify with. Rise recognizes the importance of maintaining consistent branding for both your external and internal audiences. Rise provides a robust theming engine allowing you to provide a consistent experience for all users. Rise enables beautiful departmental and location based content that provide the most relevant and contextual information needed. Content authors are enabled to communicate effectively through intuitive templates and controls. Allowing users to access important information such as news, important documents, key contacts, and more. Rise provides wizard-based administration tools that enable your admin team to keep Rise current and providing the latest and greatest features to your users. Content authors will enjoy the streamlined publishing process and editing simplicity. Rise enables a rich Directory experience for Applications, Documents, and People providing quick access to common tools and allowing users to find expertise and work together more efficiently. Rise enables translation of content to more than 50 supported languages, removing language barriers and allowing users access to content in their native language regardless of the language content was published in. Each company has a unique structure and way of doing things. Rise is built to be flexible and adjust to your unique requirements. Rise allows you to maintain centralized control over your intranet’s information architecture and navigation so that all users enjoy a consistent experience. Rise allows you to surface the right information at the right time, ensuring an up-to-date and relevant experience. We understand that the rollout of a new technology can be challenging and that gaining long-term adoption is key to your success. Our dedicated Rise team will help guide you and provide support throughout the entire process. We will walk you through the installation process and make sure that your content authors are fully enabled to create beautiful content on your Rise intranet. Our dedicated team will be there to respond to any issues and answer any questions. How does Rise benefit your business? With Rise, processes that previously required custom effort – including publishing, social feed integration, professional branding, and mobile-readiness – are now available out of the box. Your team will appreciate and use the intranet as a powerful instrument for getting work accomplished, and no longer view it as a barrier to collaboration. The top intranets for 2016 as rated by the Nielsen Norman Group took an average of 1.3 years to build. Leveraging a product approach enables the lead time for your intranet launch to be shortened and lets your team focus their efforts on content, configuration, and user enablement, rather than development and testing. With Rise you can measure your intranet timeline in weeks, not months or years! Every custom development project carries risk. By leveraging an intranet-as-a-Service solution you can start with pre-tested components allowing you to focus on configuration, not customization. Best practices are designed into Rise from the start and backed up with world-class support. The average lifespan for an intranet is 3-5 years. Within most organizations the value of the intranet will significantly degrade over time unless the company has continuously invested in maintenance and new features. Rise provides a dedicated product team which is continually enhancing the product and keeping pace with the latest trends in intranet technology. Over the same 3-5 year period, your Rise intranet will increase in value with the release of new and innovative features. Rise is a product of Perficient, one of the top Microsoft partners in the industry. Our dedicated Rise product and support team is committed to your continued success with your Rise intranet. Our ongoing investment in Rise ensures that your intranet will remain up to date with the latest innovative features for years to come. Get in touch to schedule your demo of Rise today!